The gemstone most associated with Crown Princess Mary is probably the ruby, thanks to that large and newly flexible Danish Ruby Parure. But the second must be the aquamarine, because the aforementioned earrings are just part of a group of those blue-green stones she wears frequently, and that group includes some of the more important pieces in her personal collection. These jewels were presents from Crown Prince Frederik. The first pieces of her aquamarine collection debuted during her engagement (and for this reason, many have speculated that they could have been Frederik's engagement presents to her). These included earrings with a single pear-shaped aquamarine surrounded by diamonds and a necklace with a rectangular aquamarine surrounded by sapphires on a five strand pearl choker with sapphire spacers. The combination of stones is unusual but effective, adding subtle dimension and a subtle modern touch to what could have been a rather old-fashioned jewel. The choker was first worn at a state banquet during the Romanian state visit in March 2004. Several months after their wedding, in September 2004, the larger earrings debuted. 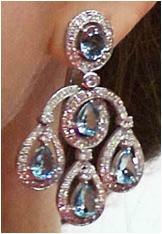 Each has five aquamarines, a mix of oval and pear-shaped stones surrounded by diamonds in a modern chandelier setting. In addition to these pieces, Mary has a ring with a very large aqua stone (seen below) and a bracelet with more pale blue stones that has been worn with the rest. The Crown Princess seems to love her husband's gifts - she wears them frequently, anyway - and they look lovely with the pale blue sash of the Order of the Elephant. Aquamarine is also a pretty smart add to her collection, considering it is not an option plentiful elsewhere in the Danish jewel vaults. All she needs now is (say it with me...): an aquamarine tiara!